The Bioscleave House, or Lifespan Extending Villa, was designed by the late Japanese architect Arakawa and his late wife, artist Madeline Gins, in their quest to develop an architecture that could reverse the effects of aging and ward off death. The experimental home is located in East Hampton, New York, and is currently listed for sale for $2,495,000. 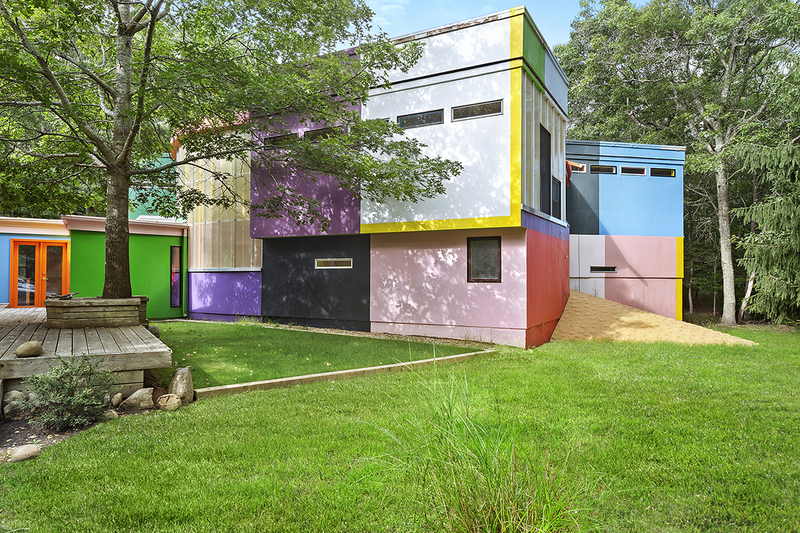 Although the four-bedroom structure appears to be a work of International Style modernism that has been subjected to a riotous 52-color paint job, it was actually designed in accordance with the couple’s own theory of aging and design, which they called Reversible Destiny. 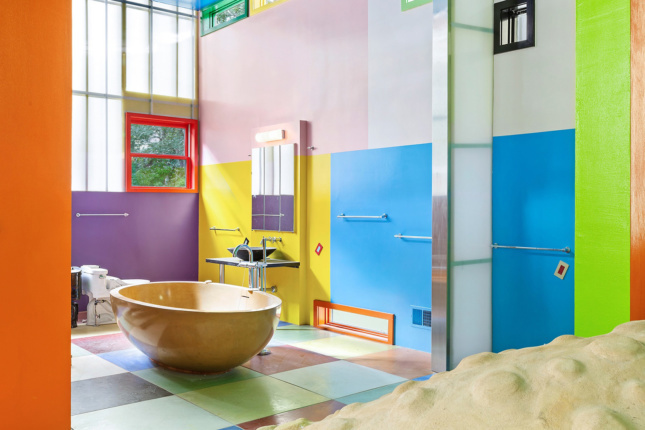 Like many of the home’s unusual features, the bold color-blocking, in keeping with their theory, is intended to keep occupants mentally stimulated. 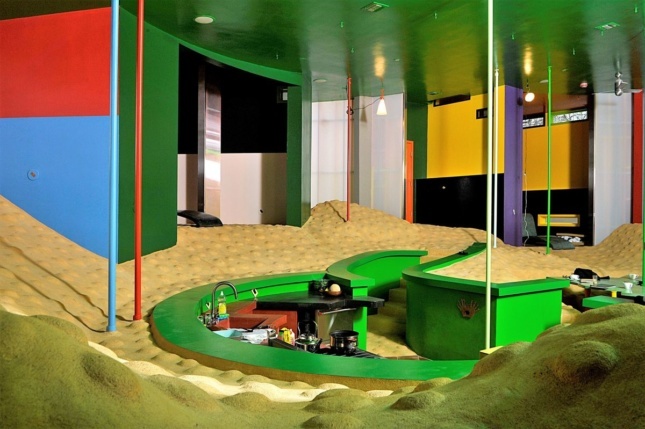 The interior, which guests must sign a waiver before entering, is an architectural obstacle course that transforms daily life into a perpetual workout. The rammed earth flooring is undulating and bumpy, challenging occupants to constantly watch their footing as they navigate between brightly colored metal poles. Every element, from the awkwardly positioned light switches to the precariously sunken kitchen, was designed to heighten body awareness and discourage complacency. Arakawa and Gins were protégés of the avant-garde artist Marcel Duchamp. They were commissioned to build the house in the late 1990s by art collector Angela Gallmann, but it was not completed until 2007 when the property was purchased by Professor Group LLC, an anonymously owned corporation. It was the couple’s first built work in the United States and the only to be completed while both were living—Arakawa passed away in 2010 and Gins four years later. If purchased by a developer, DosSantos says, the Bioscleave House will most likely be demolished and replaced with a typical 5,000-square-foot spec house, which would sell for three or four million dollars in the current market. The Reversible Destiny Foundation, a nonprofit organization tasked with preserving the work of Arakawa and Gins, declined to comment on the matter.